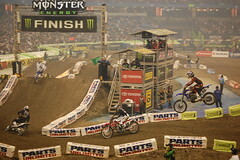 Villopoto wins for the second week in a row picking up another 3 points in the battle for first, inching closer, but perhaps too little too late. 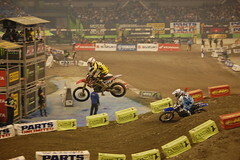 It was Honda rider Trey Conard with the hole shot, but Villopoto quickly passed him and started to distance himself from the pack. 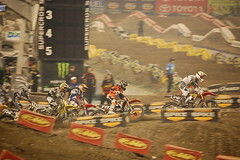 It took Dungey a little to long to get by Conard and by the time he did he was over 5 seconds behind Villopoto. 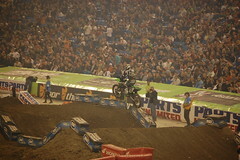 At the end it was Villopoto by 4 seconds over Dungey who took second. 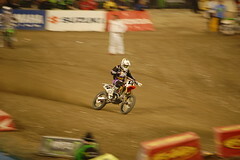 Trey Conard was a distant 3rd, 27 seconds behind Dungey! 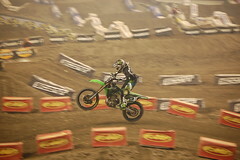 The win should give Villopoto a head of steam heading in to Dallas next week. 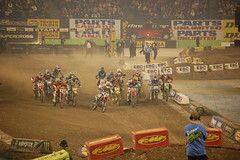 Only time will tell if it will be enough to overtake Dungey's commanding points lead. 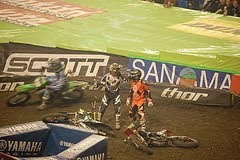 There was a bit of a fight that broke out between these two riders as one took a jump long while the one in front took it short getting hit from behind sending both of them to the ground. 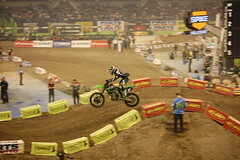 If Villopoto keeps getting starts like he did in Toronto, he will be hard to beat. 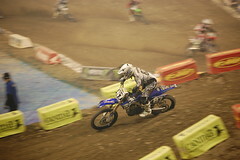 When he gets out in front he seems to hit another gear. 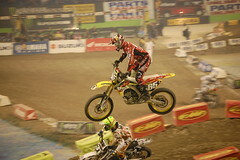 The same goes for Dungey however, making the starts critical. 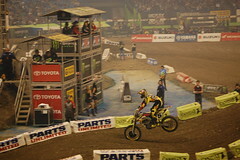 Dungey had an awesome start in his heat race, but not so much in the main. 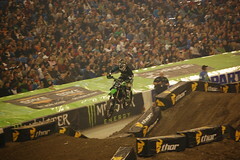 "I took too long to get into second and let Villopoto get away" Dungey said. This seemed to be the key right from the beginning as you could see the laps ticking away. With seven races to go in the series, Dungey still holds a 17-point lead over Villopoto. 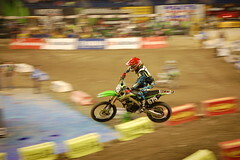 This means that either rider still holds his destiny in his own hands. 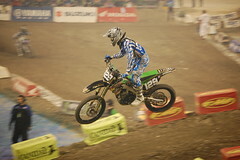 If Villopoto wins out he can still pick up the points he needs regardless of where Dungey is behind him. 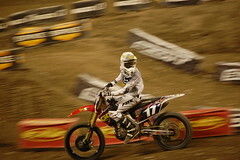 It's doubtful that Dungey won't pick up a few more wins, but anything can and probably will happen in Supercross! I didn't like this track there were very few places with even a chance of passing making the start the most important aspect. 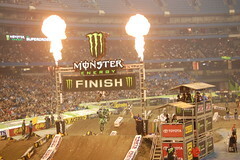 If the start is the only thing that really matters why race 20 laps? 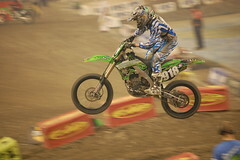 True, but Villopoto was able to pass early, Dungey wasn't. 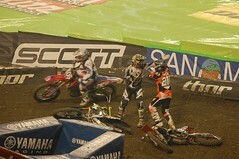 Both had similar starts..wasn't Dungey third on the first lap? 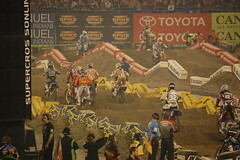 It took longer for Dungey to find the right line/technique to pass than Villopoto and that was the race. 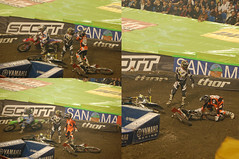 Maybe Conard tightened up after seeing Villopoto get by..I don't know. I agree though, the track wasn't as good as others have been. Awesome pics Tony! 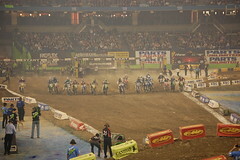 The shot where the two guys are standing in the middle of the track really looks quite crazy. It looks as if they are having a standup brawl while the race is going on around them. Great shot man!